When the time comes to buy a home, most buyers want to quickly get the paper work down, the money transferred and the furniture moved in. After all, the moving process can be a hassle and your life has other things going on that are more important. 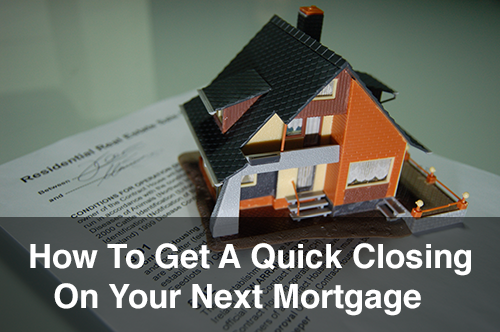 If you are someone who is looking for a quick closing on your next home purchase, there are things you can do to prepare yourself for a speedy process. Here are some tips to eliminate some of the waiting game of purchasing your next home. The first order of business is going to be making sure that your finances are prepared and ready for a home purchase transaction. You can check with your bank for mortgage rates and even inquire about mortgage pre-approvals to assure that you are prepared to buy a new home. People who have purchased homes can attest that there are far fewer things more frustrating than finding the home of your dreams, then finding out your financial affairs aren’t in order and you can’t seal the deal. Make sure you talk to your bank before you move on towards the next steps of a home purchase. Sure, everyone wants to move into their own home and have it be as perfect as they’ve always dreamed. But the reality is if you are looking for a quick closing to move into a home, you may have to sacrifice a few things here and there. If the home you are looking to close on has everything you want, except maybe the floors aren’t the right material or the walls aren’t your dream color, keep in mind that you can fix these things up after you move. If the foundation is good and the finances fall into place, these are more important factors for a quick purchase. Short sales may be tempting because of the name. But in reality, short sales have the potential of drawing themselves out for months and can leave you with more headaches then they are worth. The process of a short sale is in the hands of a bank, and the time that it takes to finalize can be drawn out for as long as the bank sees necessary. Short sales are good to save money if you have the time, but if you are looking for a quick closing, they are not a reliable option for getting into your new home. If you are looking to quickly purchase your next home, you are in luck because it is possible to do. However, in order to tilt the odds in your favor, make sure that you follow the rules on this list before you go house hunting.